Big Brother & The Holding Company first performed in the Haight Ashbury, San Francisco, in 1965. After their appearance at The Monterey Pop Festival in 1967, Janis Joplin quickly became a phenomenon, and Big Brother was a major factor in Janis’ rise to international stardom. Big Brother’s classic 1968 album “Cheap Thrills” charted at #1 for eight weeks, and has sold more that 10 million units, considered by both fans and rock historians as one of the greatest albums of all time. After Janis left the band in 1968, Big Brother continued to perform with a new female vocalist, before disbanding in 1972. Having reformed with the original four members in 1987, they have performed in Germany, Greece, England, Norway, Switzerland, Austria, Italy, Denmark, France, Brazil, Thailand, Japan, Russia, Bosnia, Mexico and throughout the United States. 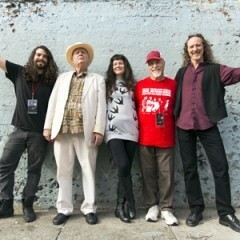 In 2007 the legendary Big Brother joined “The Summer of Love 40th Anniversary Tour” with Jefferson Starship, Quicksilver Messenger Service, David & Linda LaFlamme (It’s A Beautiful Day) and the Grateful Dead’s Tom Constanten. The next four years saw a continuation of this multi band tour teaming up with Canned Heat and Country Joe McDonald for “The Heroes of Woodstock 40th Anniversary Tour”. This lineup performed at over 30 amphitheaters and sheds, including the original 1969 Woodstock site and Los Angeles’ Greek Theatre. Big Brother’s music has been part of the soundtracks of numerous, major films: The Dreamers, Fear and Loathing in Las Vegas, Home for the Holidays, Riding in Cars with Boys, Coming Home, Monterey Pop, Petulia and others. Featuring the vocal talents of Darby Gould, guitar wizards Tom Finch and David Aguilar, and founding members bassist Peter Albin and drummer Dave Getz, Big Brother & The Holding Company celebrates 2018 performing all of Janis’ legendary hits.